Here is a building from downtown Davis called Phoenix House. It’s called that because of the Irish word for ‘water’, Uisce (see also whisky), or clear water to be precise, ‘fionn uisce’, anglicized as ‘phoenix’. Actually, no it doesn’t. I’m thinking of Phoenix Park in Dublin. There is a Phoenix Park in Sacramento as well but that isn’t a real park let alone have anything to do with phoenixes or water, clear or otherwise. Ok it might be a real park, I don’t know. Quit with all the sidetracking, this isn’t a Twitter comments thread. 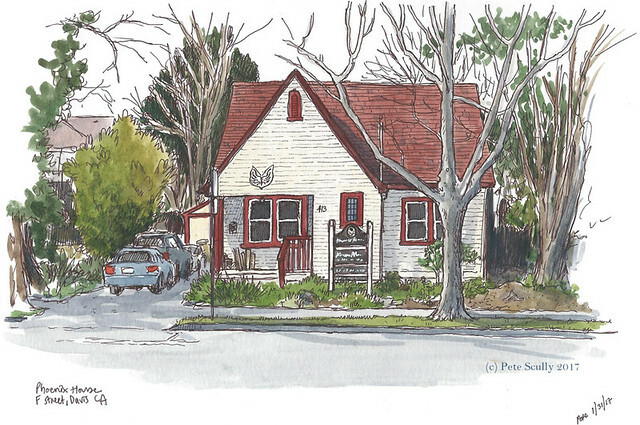 Phoenix House in Davis is named after the Order of the Phoenix. No, it’s not that either. Perhaps, and this is the most likely and believable story (with zero evidence, but when does that matter any more eh), it was a house that burned down and was rebuilt, hence Phoenix reborn from the ashes. A bit like La Fenice, the grand opera house in Venice. You know I could look this up and do some actual research, but alternative facts are the order of the day. Reality has become so quantum, we will have to start naming the different Earths soon, like in the Marvel Universe. Perhaps this was named for the famous but under-reported Phoenix Green Massacre. Or it was named after the classical Mesopotamian King Phoen the 9th. Or maybe seven guys whose initials spelled out PHOENIX, Paul, Horace, Oswald, Elliot, Norman, Isaac and Xavier, and they ran an independent pony express (or ‘Pon-ex’ as they sometimes called it) firm from that very spot. You don’t know. I could make it all up. I could have invented the whole building. That car might have been red, those windows might have been triangular. Sad! Anyway none of that is the case, and this is Phoenix House on F Street (or “Ph Street” as I call it), and one day I promise I will learn about its history, but whether I believe it or not is something I cannot tell. As a non-whiskey drinker I always forget which is the Scottish and which is the Irish spelling, I’ve always used both. I never liked whisky/whiskey much. As for American readers, I just assume they don’t have a clue what I’m on about most of the time, as in everyday life, they nod and smile and shrug their shoulders when I’m gone. I still use British spelling (and pronunciation) although I do occasionally say “zee” now, but with a raise of the eyebrows as if I really don’t approve of that sort of thing. The Scots drop the e, for reasons only known to the Scots. Their version of Gaelic is slightly different to ours. As is their whiskey. Or whisky. And yes, one should thoroughly disapprove of ‘zee’ and other abominations. Like aluminum. Stuff doesn’t even exist. Take that, Americans! Thanks for all the background research – love it!